As an NCAA Division III school, Plymouth State is home to the true student-athlete: the student who exhibits the same drive, dedication, and commitment to excellence both in and out of the classroom; who studies hard for a rewarding future; and plays for the love of the game. PSU social work major Nora Galvin ’14, from Windham, New Hampshire, is one such student. As a student at Salem High, Galvin not only excelled in her studies but also played both varsity basketball and varsity softball, the latter under coach Harold Sachs, the winningest coach in New Hampshire high school softball. Salem High is a big school with an outstanding Class L softball program, and the team won the championship both her freshman and senior years. 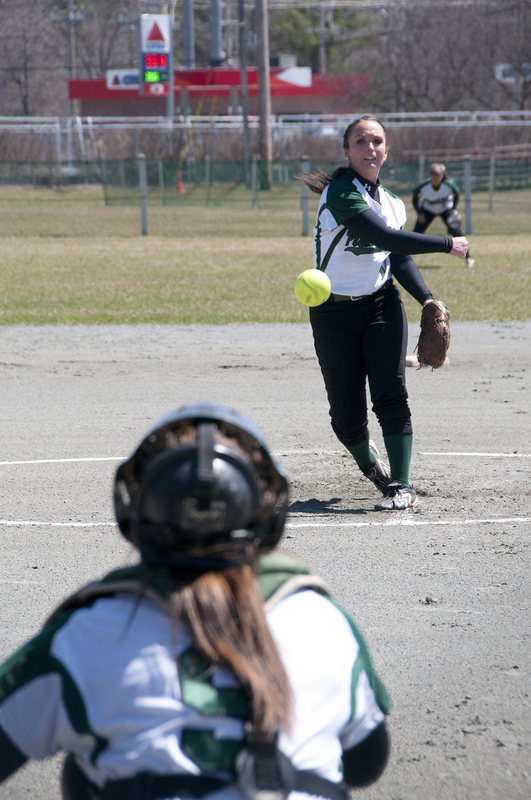 When it came time to choose which sport she would commit herself to in college, Galvin chose softball, “after having a wonderful time playing it in high school,” she says. With her top grades and prowess on the field, Galvin makes balancing academics and athletics look easy, but she’s quick to point out that it requires considerable advance planning and dedication. As a pitcher, Galvin practices year-round, so she has to plan each day, hour by hour, to include classes, study time, three to four hours of training and practice, plus games. “Every night before I go to bed I think about what the next day will look like and when I can get the work done—even the projects that are due later in the semester,” she says.